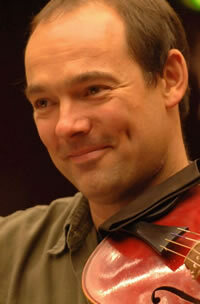 Florian Deuter, baroque violinm, has had a remarkable career in the field of Historical Performance Practice. Since Reinhard Goebel invited him in 1986 to join Musica Antiqua Köln, he has propelled himself into positions of leadership by means of his formidable talent and unquenchable energy. By 1994, he was concertmaster of Goebel’s ensemble; since then, he has led the Gabrieli Consort, the Chapelle Royale, the Collegium Vocale Gent, the Amsterdam Baroque Orchestra, Les Musiciens du Louvre and Concerto Köln among other ensembles. In 2003, in Cologne he founded the ensemble Harmonie Universelle to explore the rich and diverse literature of seventeenth and eighteenth-century chamber music. Florian Deuter plays on a violin by Matthieu Besseling, Amsterdam.